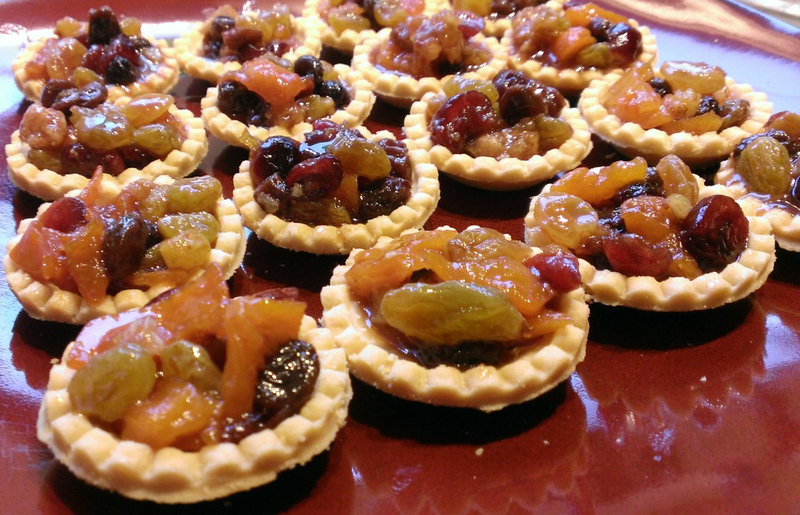 Tipsy tarts are a treat for the holidays. Laced with rum and brandy and sweetened with honey, the fruit steeps for a week in the refrigerator. I tend to avoid cherries and nuts in my holiday fruit mix and instead use a more European combination of raisins, apricots and dates. I start with soaking chopped dates in boiling water with molasses overnight and then add the other fruit until the bowl is half full. Add half a cup each of a decent brandy and a dark rum. This time I included dark agave syrup, and a jar of local honey. Covered with plastic and put it in the fridge, stirring every day for a week. The fruit soaked up the grog and became sticky and delicious. Spooned the resulting mix into tiny pie tarts (you can make your own or buy them pre-made – there are even gluten free varieties available). I added a cup of the mix to a date cake and made delicious holiday cake as well. Categories: cakes, gluten free, low salt, Vegetarian | Tags: cooking with alcohol, Desserts, entertaining, finger food, fruit, fruit mince, tipsy tarts | Permalink.